Stock markets were looking perky Tuesday morning, with easing tension over Ukraine and healthy company earnings giving investors some extra energy. U.S. stock futures were all edging slightly higher. 1. Stock market movers -- Chipotle, Netflix, Credit Suisse: Shares in Chipotle (CMG) were surging by roughly 10% in premarket trading after the fast-food chain posted earnings that beat expectations. "[Chipotle] blew away consensus estimates," said Brian Sozzi, CEO and chief equities strategist at Belus Capital Advisors, predicting continued strong earnings growth over the next two quarters. Shares in Netflix (NFLX) rose about 1% after the video rental company reported its latest set of quarterly earnings and revealed it now boasts over 50 million members. Credit Suisse (CS) shares were dipping by about 2% in Switzerland after the bank reported a loss in the latest quarter. In May, the bank pleaded guilty to federal charges that it illegally allowed some U.S. clients to evade taxes, leading to a $2.6 billion settlement. 2. 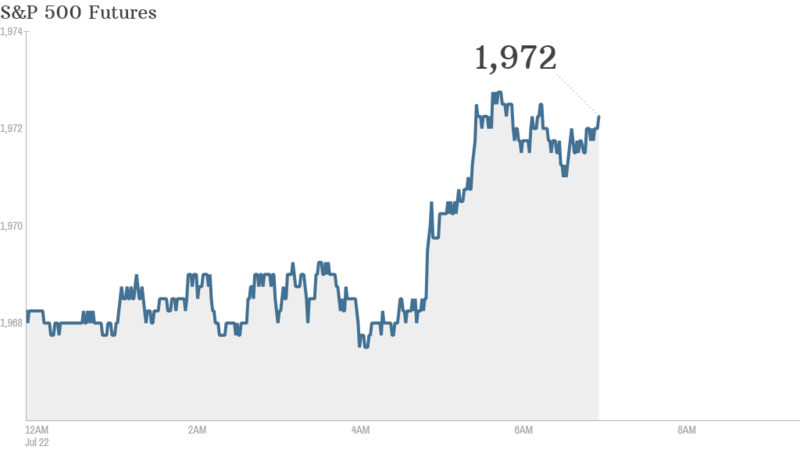 Tensions ease over Ukraine: European markets were all rising by less than 1% in early trading as tensions in Ukraine appeared to ease slightly. After delays and setbacks, a train carrying the bodies of most of those who died in the MH17 plane crash began moving out of eastern Ukraine. Still, EU officials are meeting Tuesday to discuss further sanctions against Russia in a bid to end its support for separatist rebels in Ukraine. Western leaders say the bulk of evidence suggests the rebels shot down the Malaysia Airlines plane. 3. Earnings and economic data: Many big corporate names will be reporting quarterly results Tuesday. Coca-Cola (CCE), Domino's (DPUKY) and McDonald's (MCD) will report earnings before the opening bell. Verizon (VZ), Comcast (CCV) and Harley-Davidson (HOG) all reported boosts in earnings, compared to the year-earlier quarters. Apple (AAPL) and Microsoft (MSFT) will report after the close. On the economic front, the U.S. government will report the latest consumer price index number at 8:30 a.m. ET. Stats on existing home sales from June will be reported at 10 a.m.
4. Monday market recap: U.S. stocks fell Monday on concerns about Ukraine and Gaza. The Dow Jones industrial average fell 48 points, while the S&P 500 and Nasdaq both ended the day off about 0.2%.